In the Trump era, courts have been put on defense. The President has suggested courts should be blamed for terrorist attacks, targeted judges for their decisions, and pardoned a government official who refused to follow a court order. 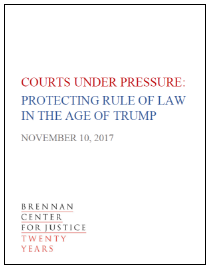 In November 2017, the Brennan Center for Justice brought together judges, advocates, scholars, journalists, and bar leaders to help assess the nature and extent of threats to the courts in the current political environment, and inform strategies and tactics for promoting the rule of law. On Tuesday, the NYU Law Review published articles and responses coming out of the discussion, including an analysis by Judge Nancy Gertner on judging in a time of Trump, a national experiment by Michael Nelson and James Gibson on how criticism of the Supreme Court affects public support for the Court, and a piece by Shirin Sinnar on the dependence of oversight institutions within the executive branch on unwritten norms, among other pieces. The symposium articles assess the seriousness of current threats to the courts, grapple with potential solutions for protecting the courts and bolstering the rule of law, and examine the way such threats impact public perception of the courts. On May 22nd, Arkansas Supreme Court Justice Courtney Goodson will compete in a nonpartisan general election against Arkansas Department of Human Services Chief Counsel David Sterling and Arkansas Court of Appeals Judge Kenneth Hixson to remain on the bench. With more than two weeks before the election, the race has already attracted outside spending: according to the Associated Press, the Judicial Crisis Network, a national conservative group, has spent more than $160,000 on ad buys opposing Justice Goodson. In 2016, the Judicial Crisis Network spent more than half-a-million dollars on television ads opposing Justice Goodson in the race for Chief Justice of the court, claiming that “Goodson’s message to trial lawyers is clear: it’s your court.” All of JCN’s 2016 television spending was untraceable dark money. If no candidate receives more than 50 percent of the vote in the May 22nd general race, the two candidates with the largest vote shares will compete in a runoff election on November 6, 2018. Four public defenders in San Francisco are mounting a rare joint challenge to four San Francisco Superior Court judges in the upcoming June election. The candidates’ spokesperson told the SF Gate, that the campaign is in part a reaction to President Trump’s large number of federal judicial appointments. The election will take place on June 5th. To keep up this pace, the Senate is breaking with recent precedent. Last week, Mitch McConnell (R-KY) prepared a floor vote for Michael Brennan, nominee to the 7th Circuit Court of Appeals – despite Sen. Tammy Baldwin (D-WI) refusing to return her blue slip, which historically allowed home-state senators to halt nomination proceedings for a judicial nominee. If confirmed, Brennan would be the second Trump nominee confirmed despite missing a blue slip. The Senate has confirmed 33 of the Administration’s judicial nominees: 15 to courts of appeals, 17 to district courts, and Supreme Court Justice Neil Gorsuch.